The Confucius Institute (CI-UCC) has held an exhibition to showcase different art masterpieces from China at the Amissah Arthur Language Centre. The event was organised by Greenhouse International Development Ghana Limited, in collaboration with CI-UCC was on the theme “2019 Art Exhibition of Silk Road Language of Art: Soulful Silk Road - Prosperity Together”. 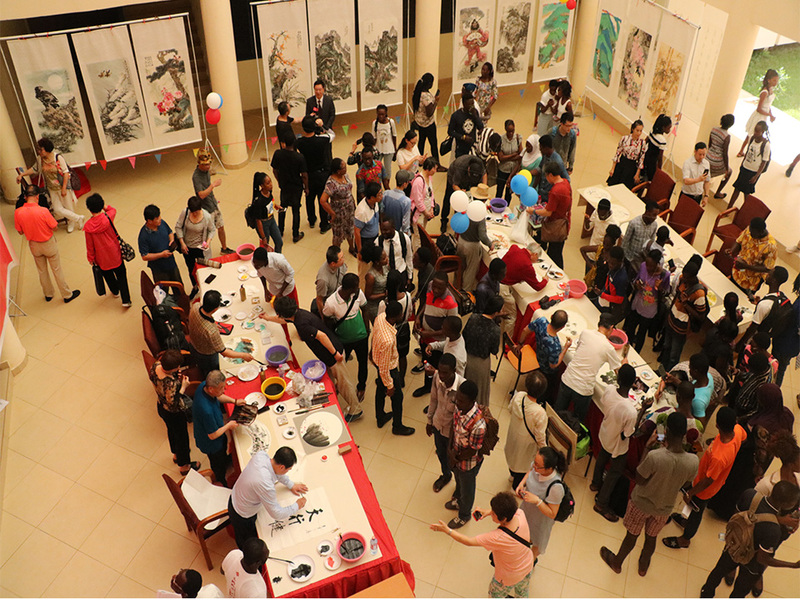 The exhibition showcased different art masterpieces of Freehand (Shui-mo) painting, Chinese Landscape painting, Figure painting, Floral (Flower) painting and Calligraphy by a group of well-known painting and Calligraphy artists from China to actively practice cultural and artistic cooperation and exchanges with the people of Ghana. Speaking at the Opening Ceremony, the Deputy Regional Minister, Hon. Thomas Yaw Adjei-Baffoe indicated that his interest was in the conversion of the art pieces for a better and valuable exchange to help empower the people in the country for development. “We have come to a critical stage in our development and we need China to partner us so that we can get to our destination,” he noted. Mr. Baffoe added that the event should serve as an opportunity for Ghanaian students, to connect and tap ideas not only for appreciation but for creativity and innovation to affect the domestic culture and boost the economy. He was grateful to CI-UCC for the initiatives of the Chinese Government for their efforts to support Ghana. “We will also continue to support and partner them in all the necessary space available but on legal and fruitful grounds,” he assured. In his welcome address, the Provost, College of Humanity and Legal Studies, Prof. Francis Eric Amuquandoh, expressed his gratitude to the Government of China for its’ initiatives to help strengthen the international friendship and cooperation with Ghana. He said, “I know this partnership will generate the right opportunities for Ghanaians and Chinese to understand and appreciate their cultural, economic, political and academic status to influence the fruitful and peaceful development.” The Provost commended CI-UCC, for their coordinating effort, and urged them to continue to serve as a bridge to link Ghana and China in order to realise the great potentials between the two countries. Prof. Mensah used the occasion to call on the general public, especially the Ghanaian artists, students and lecturers to come and observe and appreciate the Chinese works of art to learn their philosophies, and connect with them to exchange ideas. The programme was attended by lecturers and students of the University.